ENHANCED DESIGN: - The Airator Wine Pourer has a large aerating chamber and air intake system that utilizes the Bernoulli Effect to infuse your wine with the OPTIMAL amount of oxygen. BETTER TASTING WINE: Airator Aerator will make any wine taste like an expensive quality wine! 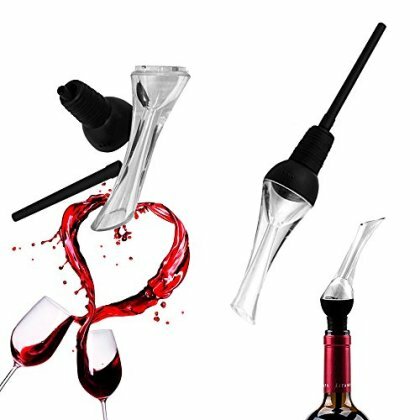 It enhance the wine taste and smell in just seconds. Makes every glass of wine taste better! Use it with any wine and get the amazing results! KEEP YOUR TABLECLOTH SAFE FROM WINE STAINS - The rubber stopper is tapered and ribbed to create a leak-free seal for wine bottles of all sizes and the acrylic pour spout is notched and ergonomically slanted for easy drip-less pouring. MADE WITH QUALITY MATERIALS - The Airator Pourer is manufactured with high quality FDA approved materials. Its elegant design will add a level of refinement to your wine drinking experience and is the perfect gift for wine lovers. EASY TO USE AND CLEAN - Ergonomic design, this is not bulky and it does not require two hands, offering breathability as it pours with no wait time. After using the pourer, you can clean it by simply rinsing it off and letting it dry. The sturdy acrylic can handle daily use and large gatherings.